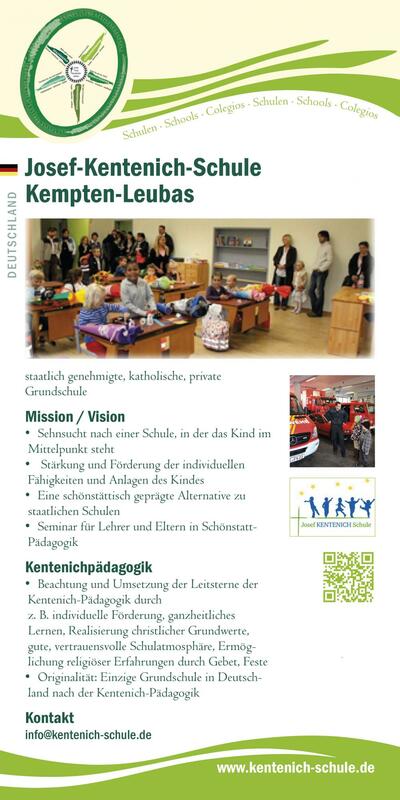 State approved, private Catholic primary school School board composed of three families belonging to the Schoenstatt Family Federation and one individual. • Longing for a school where the child is the focal point. • Strengthening and promoting the individual ability and disposition of each child • An alternative to state schools with a Schoenstatt character • Seminar for teachers and children in Schoenstatt‘s Kentenich Pedagogy Kentenich Pedagogy Application of elements of Montessori pedagogy Observing and applying the „guiding stars“ of the Kentenich pedagogy by, e.g., promotion of the individual, holistic learning, living basic Christian values, kindness, a school climate based on trust, creating a milieu for religious experiences through prayer, feasts and rituals.